Saintes Maries de la Mar in the Parc Naturel Regional de Camargue in the Provence, France is a resort town where you can walk for miles along the scenic waterfront. 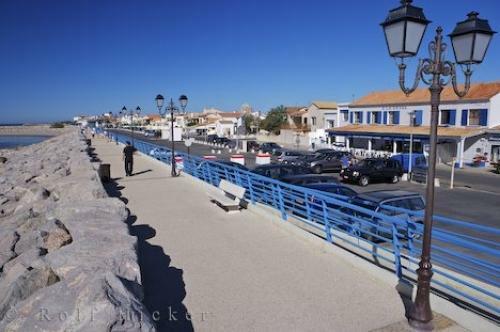 Photo of the waterfront walk in the resort town of Saintes Maries de la Mer in the Provence, France. ... Maries de la Mer in Camargue, France is famous for its oldest tradition which is the gathering of the gypsy people which takes place in May each year. It is a very exciting and famous period and the largest pilgrimage and celebration for the gypsy people. The gypsies arrive in Saintes Maries de la Mer, France a week before the festivities begin using the time gathering for marriage requests and baptisms.The town of Saintes Maries de la Mar is truly a magnificent place to visit in the Camargue, France where you can spend many hours just enjoying your walk along the waterfront. Definitely a stop to be considered on your European vacation.Beach waterfront in Stes Maries de la Mer, Parc Naturel Regional de Camargue, Plaine de la Camargue, Camargue, Les Bouches du RhoÌ?ne, Provence, France, Europe.